Author(s): Khalid Raza*. Department of Computer Science, Jamia Millia Islamia (Central University), New Delhi, India. The availability of large set of high throughput biological data needs algorithm that automatically reconstructs gene regulatory networks from these datasets. Cancerous regulatory network modules when analyzed critically may reveal the underlying mechanism of cancer, which may help in better diagnosis. Identification of cancerous genes and their regulation is an important research area in cancer systems biology. In this paper, we introduced an algorithm to infer cancerous gene regulatory network modules from gene expression profiles. 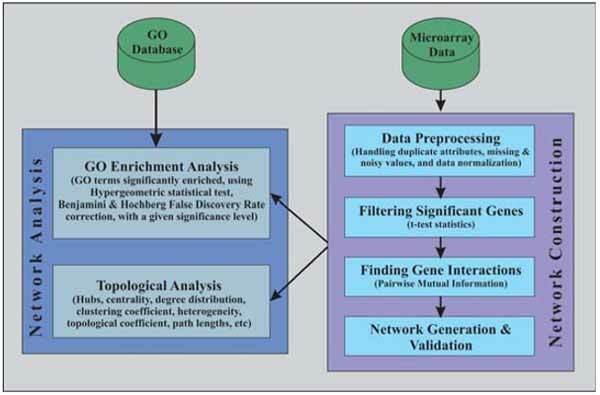 The proposed algorithm has been applied to gene expression dataset of colon cancer patients and several network modules have been identified. We performed topological analysis of inferred network modules in terms of network density, degree distribution, clustering coefficient, average path length, network heterogeneity, and centrality measures. Further, GO-based enrichment analysis of the inferred network has been performed. To validate the proposed algorithm, it has been tested on benchmark dataset taken from DREAM3 challenge project. Keywords: Gene regulatory network, biological network, systems biology, GO enrichment analysis, topological analysis, cancerous network modules. Affiliation:Department of Computer Science, Jamia Millia Islamia (Central University), New Delhi, India. Keywords:Gene regulatory network, biological network, systems biology, GO enrichment analysis, topological analysis, cancerous network modules. Abstract:The availability of large set of high throughput biological data needs algorithm that automatically reconstructs gene regulatory networks from these datasets. Cancerous regulatory network modules when analyzed critically may reveal the underlying mechanism of cancer, which may help in better diagnosis. Identification of cancerous genes and their regulation is an important research area in cancer systems biology. In this paper, we introduced an algorithm to infer cancerous gene regulatory network modules from gene expression profiles. The proposed algorithm has been applied to gene expression dataset of colon cancer patients and several network modules have been identified. We performed topological analysis of inferred network modules in terms of network density, degree distribution, clustering coefficient, average path length, network heterogeneity, and centrality measures. Further, GO-based enrichment analysis of the inferred network has been performed. To validate the proposed algorithm, it has been tested on benchmark dataset taken from DREAM3 challenge project.